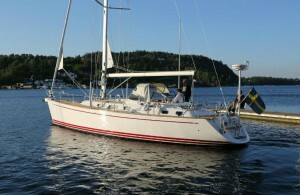 Both a Najad 355, a Najad 380 and several Najad 440 CC have been delivered and are now sailing the oceans. The production of the Najad 440 CC will continue after the holidays, followed by a number of Nord West motorboats, a Najad 460 and a Najad 410. This year, several new Nord West boats have gone to the Southern Europe. One Nord West 370 SportsTop went directly to Port Grimaud on the French Riviera, two Nord West 370 SportsTops have been launched in Slovenia and have a adventurous journey ahead through the Croatian islands, towards Cyprus and Cannes. A Nord West 420 Flybridge is on tour and has since de delivery driven through Göta Kanal, into St. Petersburg and via the canals in Russia they finally reached the Black Sea. Next stop will be in the Mediterranean Sea before the journey continues up to Scandinavia again. Every year in September HISWA in-water boat show opens its doors, this show is a floating exhibition which is open six days in September. The show takes place at the trendy shipyard NDSM in the heart of Amsterdam. Here you can see at least 400 boats in their natural element and you can also get a good overview of all European boatbuilders. In addition to the boat show so, Amsterdam is a city that is bursting with activities, invite friends and family and enjoy a memorable weekend in this beautiful city Staffan Asp and Kees Hundersmarck welcome you.